If you’re embarrassed to go barefoot or wear sandals because of thick, yellowed toenails, you can get state-of-the-art toenail fungus treatments from the expert podiatrists at Diagnostic Foot Specialists. They offer a wide range of options at five locations in southeast Texas, including Houston, Bryan, and the Houston communities of The Woodlands, The Heights, and The Galleria. If you want to get rid of your infection, call or click to make an appointment today. Toenail fungus is an organism called onychomycosis or tinea unguium. Small amounts of this fungus and other organisms live on your body every day, but when the fungus begins to overgrow, you develop an infection. Fungal toenail infections tend to develop slowly, but you should get treatment as soon as you notice symptoms. The infection will usually get more challenging to treat as it progresses, and it could spread to other toenails or your fingernails. The most common places that you might pick up a fungal toenail infection is at a public pool or a shared shower area. Fungal infections thrive in a warm and moist environment. If you have a nick or a break in your toenail and you come into contact with the fungus, it will enter your toenail and begin to multiply. You should always wear shower shoes or flip-flops instead of walking around barefoot in these environments. If you participate in a sport or exercise regularly, make sure to change out of your sweaty socks and sneakers when you’re finished, so you can keep your toes clean and dry. Your podiatrist at Diagnostic Foot Specialists will examine your toenails to look for tell-tale signs like white spots, a yellow tint, or thick, brittle toenails. They may also take a sample from your toenails for further testing. Other conditions like psoriasis can cause similar symptoms. Your podiatrist will need to examine your foot to get an accurate diagnosis and to provide the most effective treatment. 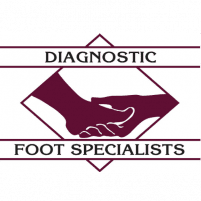 The podiatrists at Diagnostic Foot Specialists provide state-of-the-art nonsurgical treatments that have a very high success rate. They offer both oral and topical medications to fight fungal infections. They also offer laser treatments for thick, yellow, deformed toenails. The laser heats and destroys the fungus. You should notice an improvement after just one treatment. However, your podiatrist may recommend a series of laser treatments to get rid of the fungal infection completely. If you’ve noticed white spots on your toenails or that your nails are becoming yellow, thick, and brittle, call or click to schedule an appointment today.